Today was another day of our home renovation. See our start up first week here. My husband was a bit out of it yesterday suffering from some type of stomach virus or food poisoning. So he was a bit slow going but today he got his energy back and went full steam ahead with breaking up the bathroom floor. For some reason the previous owner put down 2-3 inches of cement below the tile floor. 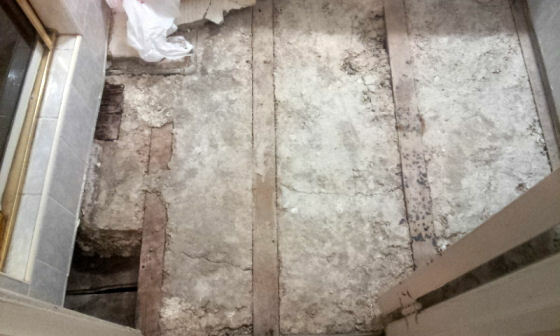 And as you can see there is another layer of cement between the floor beams. We are debating whether or not to remove this layer of cement to lighten the load on the ceiling below. Otherwise his plan is to put a layer of plywood on top, followed by a layer of cement board for the tile to be layed on. Another mystery is this hole in the corner that is void of concrete. After thinking about things we are possibly going to remove the shower stall and make it into a linen closet. We have a bathtub with shower in the same bathroom so we wouldn’t lose anything. It’s a thought although he would have to shut off the water to the stall and remove all of the tile in there, and then redo the walls. On the kitchen side Pete the Handyman was sanding the sheet rock that he spackled the previous day. The walls are looking smooth and almost ready for the first coat of primer. 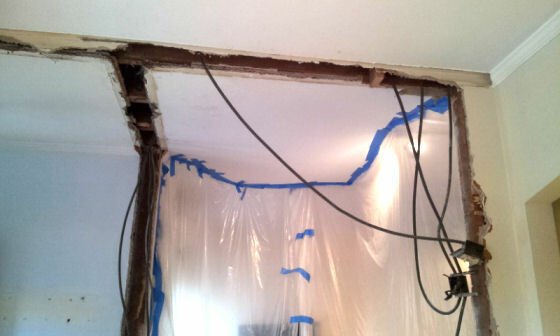 He also started closing up the ceiling holes which will be plastered over to match the rest of the ceiling. Pete also plastered the bottom of the walls in the kitchen that were still plaster. Here is a tip if your buying plaster from Home Depot, ask if they have any open or ripped bags of plaster. They will sell them to you for half off and it is the same amount of plaster you would get in a regular bag. Oh and one more thing my husband told me that while he was breaking up the cement floor in the bathroom he was singing and calling himself, “The Floor master”. Go figure, it must be a man thing. 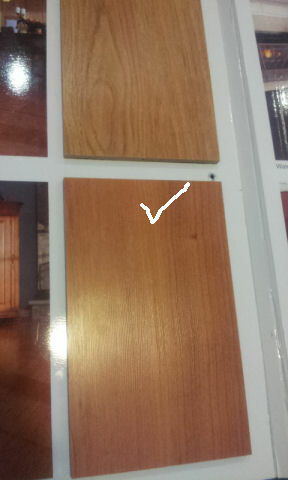 Oh and this is the color we chose for our living room/entry room/kitchen it will be one same solid floor… What do you think? I understand your war zone status! Love the color you have chosen and it will look so nice when it is finished! Way to go on the haggling!!!!! Thanks Diane…My husband is so proud of me…Well I am proud of myself too…I will show you the color once it is all done!